It’s 2017 and a good time to think about doing some cleaning in your life. Chapter 7 bankruptcy may help you. The new year is the perfect time to reorganize your home, your life, and your finances. If you’re struggling with debt you can’t afford, living paycheck to paycheck, and being hounded by debt collectors, bankruptcy might be the best way out of your financial mess. Most people don’t like to admit that they’re in over their head with debt. Saying you’re in too much debt is a hard thing to acknowledge but can be the best thing for you. Once you admit the debt is overwhelming, you can look for a solution. For many North Carolina consumers, Chapter 7 bankruptcy is the perfect solution to wipe out debt and get a clean slate. 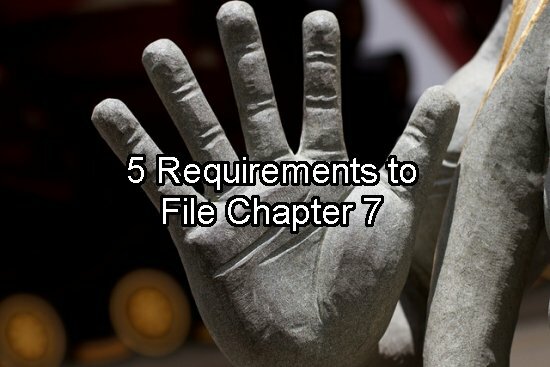 Not everyone will qualify for Chapter 7, but if you can, it represents the chance for sweeping debt relief. Here are five requirements for you to file Chapter 7 North Carolina bankruptcy. If you earn less than the median income for North Carolina, you’re on your way to filing Chapter 7. For a household of two people, income less than $50.7k qualifies. For three people, it’s $55k and for a household of four, the income level is $63.7k. If you earn more than this, you might still qualify for Chapter 7. See #2 below. Even if you earn more than the North Carolina median income, you might still qualify for Chapter 7 if you can pass the Means Test. The Means Test evaluates your income, expenses, debt, and other costs of living to see if you can afford your debt. If you don’t earn enough to pay your bills, no matter how much you earn, you likely will still qualify for Chapter 7 bankruptcy if you meet other requirements. If you had a Chapter 7 bankruptcy that went all the way through to discharge within the past eight years, you won’t qualify. If you discharged debts through Chapter 13 bankruptcy within the last six years, you won’t qualify. If you filed Chapter 13 but didn’t follow through and get a discharge, this should not stop you from filing Chapter 7 now to get rid of your debt. Discuss past filings with your bankruptcy attorney. Even if you filed a Chapter 7 or Chapter 13 and it didn’t make it to discharge, you won’t necessarily qualify for Chapter 7. The rule of thumb is that listed in #3 above, but there is another consideration. If you filed either Chapter 7 or Chapter 13 bankruptcy within 180 days prior to now, you may have to wait longer for the court to allow you to file Chapter 7 bankruptcy. You may be ineligible to file Chapter 7 bankruptcy in North Carolina if you filed a prior bankruptcy case within the last 180 days and it was dismissed because you violated a court order. You could also be ineligible if the case was found to be fraudulent or an abuse of the system by the court, you requested your case to be dismissed because a creditor tried to fight the automatic stay, or you failed to complete required credit counseling. For those that have mostly unsecured debts like credit cards and medical bills, Chapter 7 can wipe your financial slate clean and give you a fresh start. If you do have secured debt, such as a mortgage or car loan, if you are current on your payments, you can likely keep your assets during and after bankruptcy so long as you don’t have excessive equity in the assets. If you’re behind on your payments on secured debt, Chapter 7 offers some solutions to you and Chapter 13 offers a chance to catch up if you can afford a repayment plan. To find out more about the benefits of North Carolina Chapter 7 bankruptcy and see if you qualify, contact the Law Offices of John T. Orcutt today for a free appointment. Call 1-888-234-4181 now for a free North Carolina bankruptcy consultation at one of our convenient locations in Raleigh, Durham, Fayetteville, Wilson, Greensboro, Garner or Wilmington.